You can't go wrong with this brand. Find one you like & buy it today! 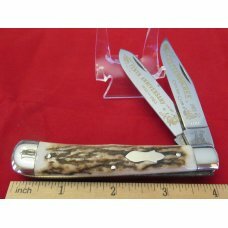 Fight'n Rooster Germany Stag "1991 Old Dominion Knife Collectors Association" 2 Blade Serpentine Stockman Knife - 1 of 150 - Serial # 075 - Beautiful ..
Fight'n Rooster Germany Stag "1989 Old Dominion Knife Collectors Association" Muskrat Knife - 1 of 200 - Serial # 154 - Beautiful Genuine Stag Handles..
Fight'n Rooster Germany Stag "1988 Old Dominion Knife Collectors" Large Lockback Sodbuster Knife - 1 of 200 - Serial # 066 - Beautiful Genuine Stag Ha..
Fight'n Rooster Frank Buster Celebrated Cutlery Germany Pearl "The Tennessean" Teardrop Jack Knife in Box c.1987 - 1 of 100 - Serial # 077 - Beautiful..
3-5/8" BUFFALO HORN CONGRESS FIGHTING ROOSTER MADE FOR THE KENTUCKY CUTLERY ASSOC. 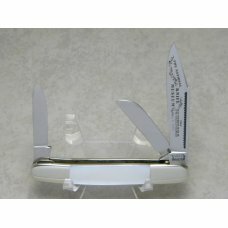 BY FRANK BUSTER CELEBRATED CUTLERY GERMANY PAYMENT BY CHECK OR PO..
Fight'n Rooster Frank Buster Celebrated Cutlery Co. Germany Pearl 5 Blade Stockman Knife - 1981 Gem Capital Knife Club - 1 of 250 - Serial # 185 - Bea..
Fight'n Rooster Frank Buster Cut. 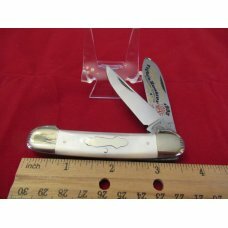 Co. Germany Gold Blade Pearl Lockback Whittler Knife - 1981 Tar Heel Cutlery Club - 1 of 400 - Serial # 212 - Genuin..
FIGHT’N ROOSTER, Frank Buster Germany Two Blade Trapper Mother of Pearl 1985 - 1 of 500 MINT FIGHT’N ROOSTER, Frank Buster Celebrated Cutlery German..
1989 Fight'N Rooster By Frank Buster Made in Solingen Germany Stag Prototype Stockman Gold Etched on Long Pull Master Blade (Peterbuilt Knife Club 198..
1983 Frank Buster Celebrated Cutlery Fight'N Rooster Etched on Long Pull Master Blade (Coal Diggers Special 1 of 1000 # 240) Made In Solingen Germany..
1983 Frank Buster Fight'N Rooster The Orange Blossom Trail 1 of 300 Pearl Handles that has a pin crack on back side at rear bolster ( made me sick)..
1982 Frank Buster Fight'N Rooster International Cutlery Club Serial # 563 0f 600 Pearl Handles with no problems Nickel Silver Bolsters & Pins, Brass ..
Fight'N Rooster Wood Handle Rope Knife Made In Solingen Germany . No Box never carried or sharpened. Strong Snap No wobble half stop . Wood Handle Wi..
FIGHT’N ROOSTER, Frank Buster Germany Two Blade Trapper Mother of Pearl 1982 - 1 of 600 MINT FIGHT’N ROOSTER, Frank Buster Celebrated Cutlery German..
FIGHT’N ROOSTER, Frank Buster Germany 6-Blade Stockman Mother of Pearl 1984 1 of 600 MINT FIGHT’N ROOSTER, Frank Buster Celebrated Cutlery Germany. 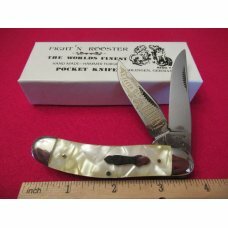 ..
FIGHT’N ROOSTER, Frank Buster Germany 3-Blade Stockman Mother of Pearl 1983 1 of 600 MINT FIGHT’N ROOSTER, Frank Buster Celebrated Cutlery Germany. ..
Fight'n Rooster Solingen Germany Christmas Tree Miniature Pen Knife - Beautiful Christmas Tree Celluloid Handles - No Cracks - Brass Liners - Snaps Op..
1997 Fight'N Rooster Frank Buster & Son Little Bit of Heaven 1 of 100 . new in box never carried or sharpened. Pearl Celluoid Handles with no chips ..
1988 Frank Buster Fight'N Rooster Long Pull 3 Blade Stockman . New in Box never carried or sharpened. Celluloid handles with no chips or cracks . Look..
good used condition, good snap no cracks, good user bone handles..
Fight'n Rooster Frank Buster Celebrated Cutlery Germany Pearl "Middle Tennessee Knife Collectors" Irish Congress Jack Knife c.1982 - 1 of 400 - Serial..
Fight'n Rooster Frank Buster Cutlery Co. Germany Pearl "Florida Knife Collectors" Stockman Knife c.1980 - 1 of 300 - Serial # 039 - Beautiful Genuine ..
Fight'n Rooster Frank Buster Cutlery (Japan) Pearl 1980 NKCA Museum Founders Stockman Knife - These aren't marked as such but they were made in Japan ..
Fight'n Rooster Germany Celebrated Pearl "International Cutlery Club" 3 Blade Jack Knife c.1983 - 1 of 600 - Serial # 312 - Beautiful Genuine Mother o..
Fight'n Rooster Frank Buster Cutlery Co. Germany Pearl "Kentucky Cutlery Assn." 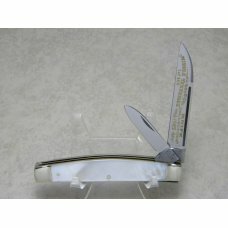 6 Blade Congress Knife c.1982 - 1 of 600 - Serial # 294 - Beautiful Ge..
Fight'n Rooster Germany Pearl "Kentucky Cutlery Assn." 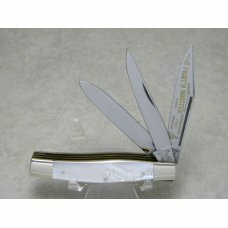 8 Blade Congress Knife c.1983 - Delta Queen - Belle of Louisville - 1 of 600 - Serial # 429 - B..
Fight'n Rooster Germany Celebrated Pearl "International Cutlery Club" 12 Blade Congress Knife c.1985 - 1 of 600 - Serial # 509 - Beautiful Genuine Mot..
Fight'n Rooster Germany Celebrated Black "Air Borne 101st Clarksville, TN" Stockman Knife c.2005 - 1 of 200 - Serial # 050 - Slick Black Handles - No ..
Fight'n Rooster Germany Celebrated End of Day "One Life To Live" Soap Opera Stockman Knife c.1996 - 1 of 250 - Serial # 141 - End of Day Celluloid Han..
Fight'n Rooster Germany Celebrated Silver Pearl "Texas Longhorn" Stockman Knife c.1999 - 1 of 400 - Serial # 115 - Silver Pearl Celluloid Handles - No..
Fight'n Rooster Germany Celebrated Blue Wave "Yellow Jacket" Stockman Knife c.2006 - 1 of 600 - Serial # 108 - Blue Wave Celluloid Handles - No Cracks..
Fight'n Rooster Germany Celebrated Bronze Cracked Pearl Congress Knife - 1 of 70 - Bronze Cracked Pearl Celluloid Handles - No Cracks - Nickel Silver ..
Fight'n Rooster Germany Celebrated Pink Cracked Pearl Congress Knife - 1 of 200 - Pink Cracked Pearl Celluloid Handles - No Cracks - Nickel Silver Bol..
Fight'n Rooster Germany Celebrated Blue Wave 4 Blade Congress Knife - Blue Wave Celluloid Handles - No Cracks - Nickel Silver Bolsters - Brass Liners ..
Fight'n Rooster Germany Celebrated Stainless Snakeskin Pearl Stockman Knife - Snakeskin Pearl Celluloid Handles - No Cracks - Nickel Silver Bolsters -..
Fight'n Rooster Germany Celebrated Rose, Gold & Black 3 Backspring Whittler Knife - 1 of only 250 made - Rose, Gold and Black Celluloid Handles - No C..
Fight'n Rooster Germany Green & Black 12 Blade Congress Knife 1 of only 100 made c.1985 - Green & Black Celluloid Handles - No Cracks - Nickel Silver ..
Fight'n Rooster Germany JRN Gold Miniature Watch Fob Lobster Knife - Part of a set of 3 - Metal Handles - Snaps Open and Shut - No Wobble - Very Nice ..
Fight'n Rooster Germany Celebrated Wood Sowbelly Peterbilt Knife Club 10th Anniversary 1989-1999 - 1 of 170 - Serial # 086 - Wood Handles - No Cracks ..
Fight'n Rooster Germany Celebrated Lilac Purple Metallic Chip "Rolling Stones Gather No Moss" Toothpick Knife c.1993 - 1 of 150 - Serial # 012 - Lilac..
Fight'n Rooster Germany Celebrated Orange "Tennessee" Toothpick Knife c.1994 - 1 of 300 - Serial # 094 - Orange Celluloid Handles - No Cracks - Nickel..
Fight'n Rooster Germany Germany Buffalo Horn Gold Blade Toothpick Knife 15th Anniversary Knife World 1992 3rd Edition - 1 of 500 - Serial # 065 - Genu..
Fight'n Rooster Germany Celebrated Blue & White Swirl Swell End Knife - Blue & White Swirl Celluloid Handles - No Cracks - Nickel Silver Bolsters - Br..
Fight'n Rooster Frank Buster Cutlery Co. Germany Yellow Stockman Knife Pre 1982 - Smooth Yellow Celluloid Handles - No Cracks - Nickel Silver Bolsters..
Fight'n Rooster Germany Celebrated Blue, Black & Silver "Ohio" Sod Buster Knife c.1993 - 1 of only 400 made - Beautiful Blue, Black and Silver Cellulo..
Fight'n Rooster Germany KB (Krusius Brothers) Blue and Black Swirl Budding Knife - 1 of only 13 made - Beautiful Blue and Black Swirl Celluloid Handle..
Fight'n Rooster Frank Buster Cut. 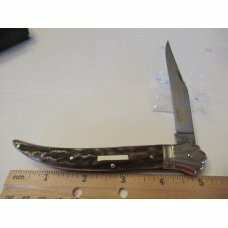 Co. Germany Black and Gold Metal 2 Blade Pen Knife Pre 1982 - 1 of 200 Made with this color handle - Snaps Open and ..